HTC is doing everything in its power to get you to switch to their new flagship, the One, over the competition. This may be there last shot at a comeback as Samsung’s brand continues to grow, LG is posting record smartphone sales quarters, and Motorola has the backing of Google on their side. They have already launched a nationwide tour to show off the device in pubic places, a handful of which include concerts with artists like Pharrell. To continue on with their promotion, they are making this weekend the weekend to upgrade to the One. 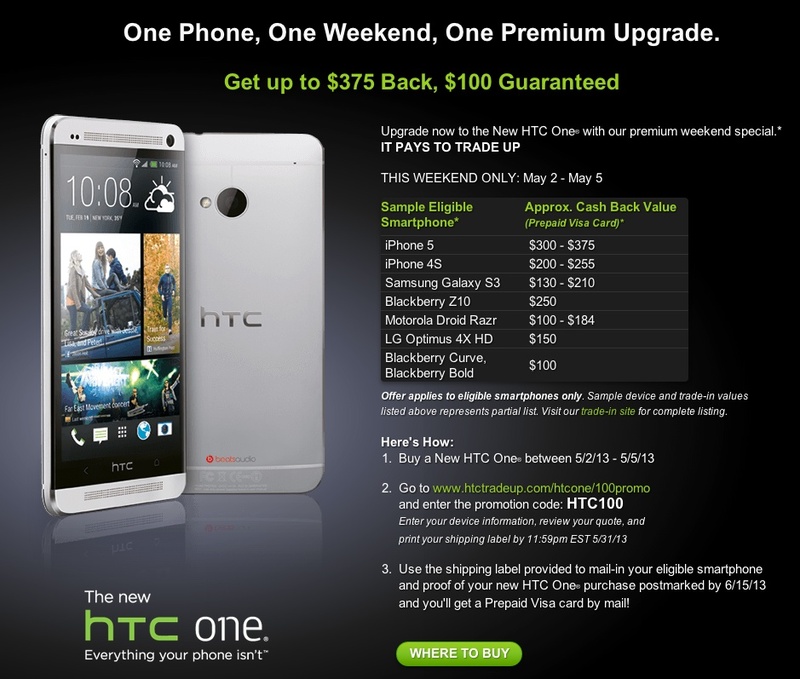 The deal is called “One Phone, One Weekend, One Premium Upgrade.” Should you choose to buy the HTC One from today (May 2) through May 5, HTC will give you up to $375 back on eligible smartphones that you trade in. As one would expect, the iPhone 5 is worth the most, followed by the iPhone 4S and then Galaxy S3. In the image above, you can see some of the other approximated values of potential trade-in devices. So this is how it works – you buy the One, cruise to HTC’s trade-up site, enter the promo code “HTC100,” and then enter information about the device you are trading in (or “up”). HTC will give you a quote on its value, which you can accept if you like. Should you accept, a shipping label will be there for printing, so that you can send in your device. Return your phone by 6/15/13 and HTC will send you a prepaid Visa card. Don’t forget to check out our HTC One review if you haven’t already.